Mount Florida (Scottish Gaelic: Cnoc Florida) is an area in the southeastern corner of the city of Glasgow, Scotland. The Glasgow district of Mount Florida originated on the "Lands of Mount Floridon" which were described in detail when offered for sale at auction on 21 September 1814. The notice in the city's Herald newspaper described the estate as consisting of upwards of 15 acres, with a mansion house containing 2 dwellings and gardens well stocked with fruit trees. Contemporary maps from the 1850s show the old house renamed as "Mount Florida, (Ruin)". It was entered from Prospecthill Road and consisted of two semi-detached dwellings and surrounding gardens. Much of the present suburb is situated in the area to the south of the old house. This ground was part of the "Lands of Clincart", which were put up for sale by auction on 28 June 1836. A farmhouse and 95 acres of land were offered for potential residential development. Mount Florida is served by the Mount Florida railway station which lies upon the Cathcart Circle railway line. The area is home to Langside College and the newly developed NHS Victoria hospital on the fringe of Queen's Park, which opened in 2009. 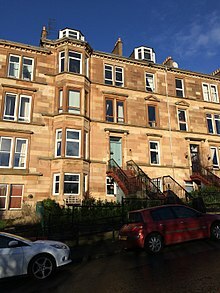 Primarily a residential area, Mount Florida's housing stock largely comprises traditional tenemental buildings with the addition of two of Glasgow's high rise structures which dominated much of the 1960s housing regeneration in the city. The main road through the area is Cathcart Road, a major route through Glasgow's south side. Scotland's National Stadium, Hampden Park, is located off Cathcart Road in the heart of Mount Florida. The 51,866 seater stadium is home to the Scottish Football Association, and Scottish Football League Third Division club team Queen's Park. The stadium has also played host to numerous large music events and was the track events stadium for the 2014 Commonwealth Games in Glasgow. Mount Florida is also home to numerous lawn bowling clubs, including Glasgow's Indoor Centre. The local green area of Cathkin Park was home of the now defunct football club, Third Lanark. The critically-acclaimed Netflix series Lovesick used this flat in Mount Florida for its external scenes. Mount Florida is in the Langside ward for Glasgow City Council and since May 2012 is represented by Councillors Archie Graham, Susan Aitken and Liam Hainey. Mount Florida lies within the Glasgow Cathcart Scottish Parliamentary constituency. The sitting MSP is James Dornan. Mount Florida is in the Glasgow South UK Parliament constituency, and the sitting MP is Stewart McDonald. As part of the system of local democratic representation there is an active community council. Creation Records founder Alan McGee and Primal Scream vocalist Bobby Gillespie both grew up in Mount Florida and attended Kings Park Secondary School in nearby Simshill. Mount Florida has also produced a Glasgow musical group by the same title, who were signed to Matador Records and named themselves after the area. They have to date one album by the title 'Arrived Phoenix', released 30/01/2001. The Glasgow-based novelist, J. David Simons, grew up in the nearby Kings Park district and attended Mount Florida Primary School in the late 1950s. ^ "Victoria Hospital Glasgow, Building, Architect, Victoria Hospital". Glasgowarchitecture.co.uk. Retrieved 28 April 2013. ^ "Exploring Mount Florida". Archived from the original on 15 November 2006. Retrieved 7 March 2008.